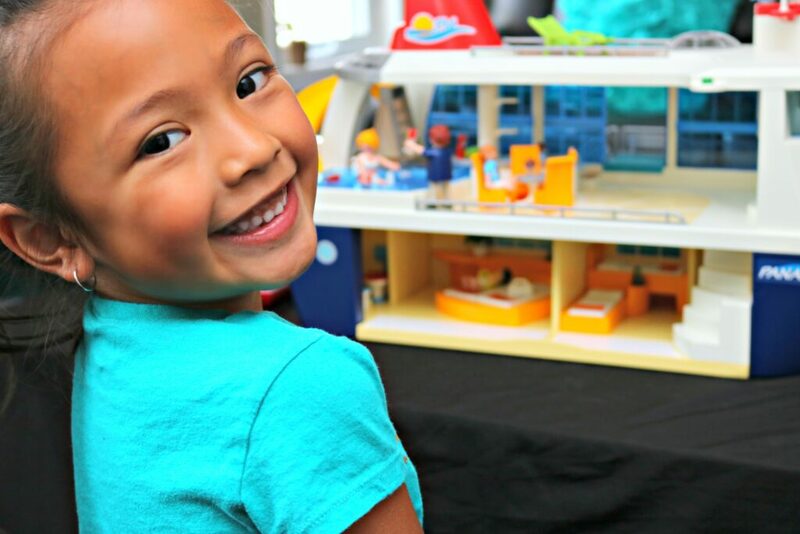 You are here: Home / Product Reviews / Babies & Kids / Hit the High Seas with the PLAYMOBIL Cruise Ship + Giveaway! 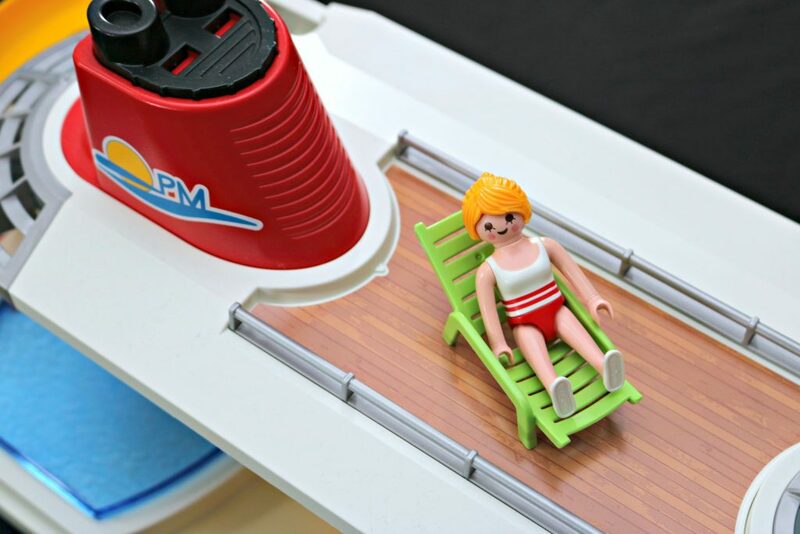 Hit the High Seas with the PLAYMOBIL Cruise Ship + Giveaway! All Aboard on the PLAYMOBIL Cruise Ship! Hitting the high seas on a gorgeous ship is something that we all love to do. Enjoying all the amenities, making memories and discovering new countries at each port is what dreams are made of, right? With the PLAYMOBIL cruise ship, your kids have everything they will need to for their next aquatic adventure. The girls have been lucky enough to go on a few cruises and they absolutely love it. Mimi and Gabs feel that it is like stepping into a floating hotel. That is, a floating hotel that is fully stocked with all the delicious food, fun activities and luxuries that they can imagine! One of the things that I love about PLAYMOBIL is that they are very detail oriented and this PLAYMOBIL cruise ship is no exception. They’ve thought of everything right down to the suites and the food! 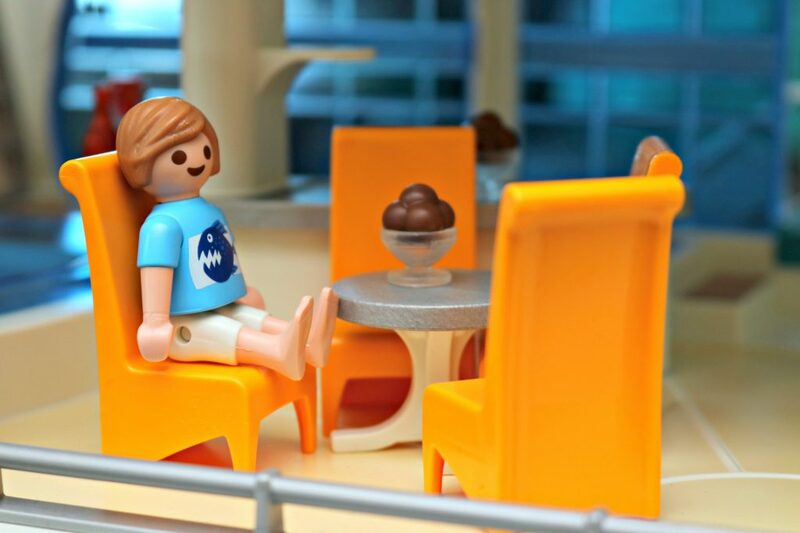 When we had the chance to test out the PLAYMOBIL cruise ship, Mimi was over the moon. Mimi has especially loved our cruise experiences and was wide-eyed when she took her first one. So, to have her very own cruise ship, well, that to her is awesome. She has named it the PLAYMOBIL Dreamcatcher. Even though it is dubbed Panama, she said she wanted to give it her own flair, so she did. Setting everything up took Darasak and Mimi less than 20 minutes. In no time, it was playtime. Mimi had her characters sitting on the deck, taking in the sun and enjoying chilled drinks. How cool is that? What I enjoyed the most was seeing her re-enact things we do on our cruises. She has been playing with this ship for hours on end, I have to remind her to stop and read a book too! But, seriously, I’ve heard her have her characters say, “Sip, sip, mmm, champagne!” and it cracked me up to no end. Makes you think of what they see on cruises really sticks with them and you can’t help to laugh! Hop abroad the PLAYMOBIL Cruise Ship for the holidays of your life. You can be greeted by the ship’s captain, settle in your ensuite cabins, and decide which activity to do next: sliding down into the swimming pool, sunbathing on the sundeck or enjoying a meal at the bar. As the cruise sets sail, wave goodbye and enjoy the view. 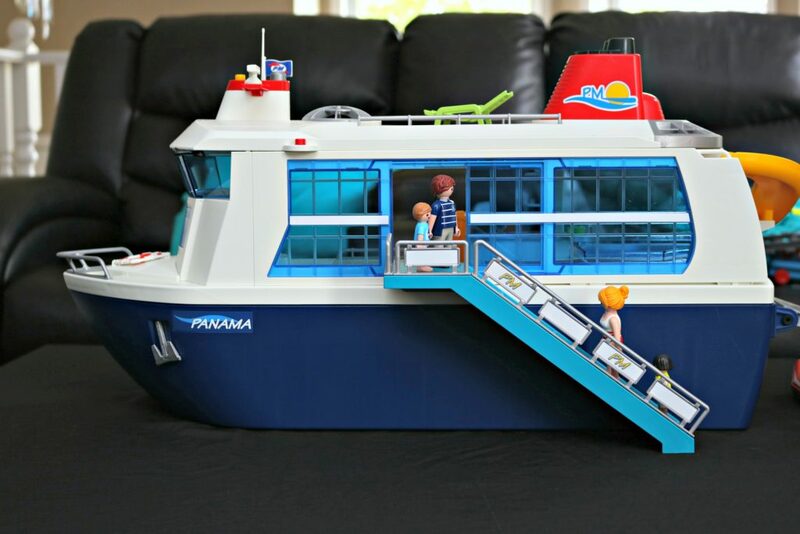 Playset includes cruise ship with two ensuite bedrooms, reception desk, bar, fillable swimming pool, sun deck and cockpit, and many more accessories! One lucky Whispered Inspirations reader will get to set sail with this PLAYMOBIL Cruise Ship playset, a value of $132.99! This contest is open to Canada only, excluding Quebec. It opens on July 14 and closes on July 29. 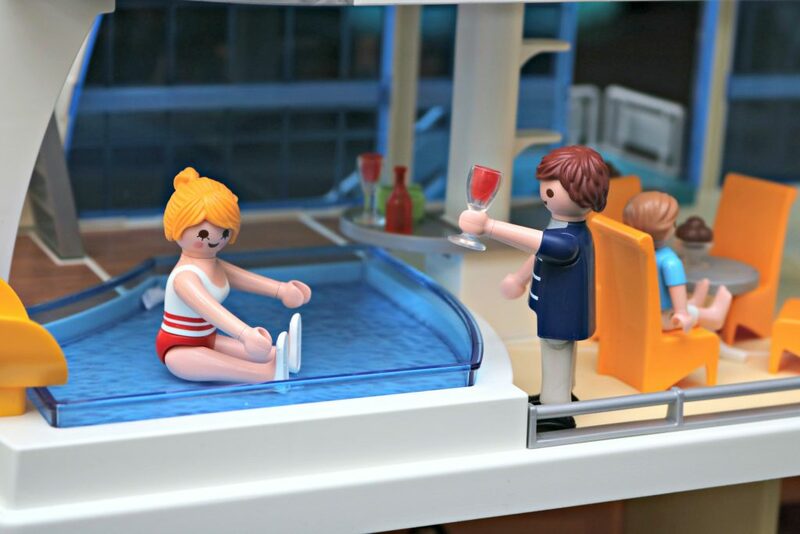 For more information about this fun cruise ship, visit PLAYMOBIL, here. What do you love about cruising? Previous Post: « PLAYMOBIL Ghostbusters Play Sets + Giveaway! Never been on a cruise, but my kiddo would absolutely love this cruise ship! My granddaughter would love this set! She loves pretending to do things with her toys and this would be something different for her. My daughter would love the Playmobil Cruise Ship! The slide and pool features are fun and offer imaginative play. I have been on a cruise with my family when I was younger. I would love to take another so my little one can experience being at sea and all the fun activities onboard. Disregard my first click on didn’t notice right away that this is for Canada only and not the USA. Sorry. I have been on 4 cruises (twice to the Caribbean) 1 to the Mediterranean, and 1 to Alaska so far and loved them all. 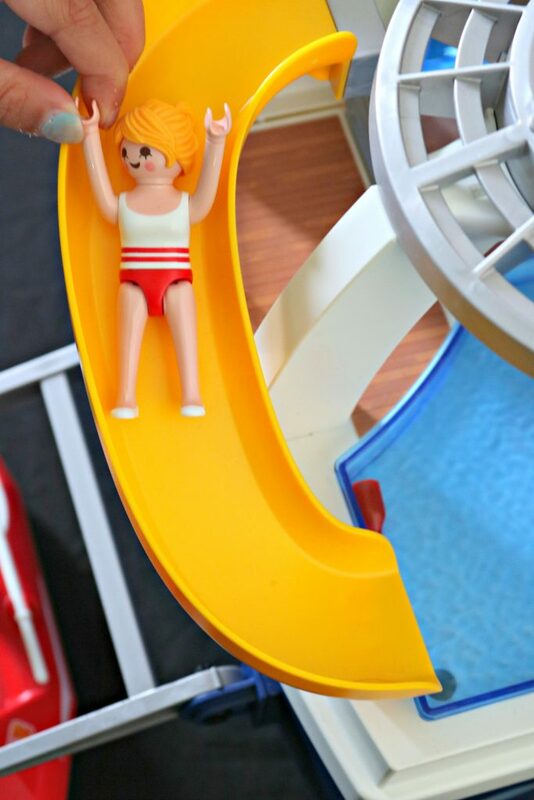 I would like to win the Playmobil Cruise Ship because I know that my grandson would have hours of fun with it. It features all of the fun elements of cruise ships! My daughter would love this pay set. She’s been obsessed with boats lately. I went on a cruise once with my hubby and I would love to go on another one. I have never been on a cruise but am hoping to take an Alaskan cruise someday soon. I am sure my niece would love this playset! My child would love this play set as there are so many ways to play with it, lots of imagination opportunities! My little cousins would totally love this play set. I’ve never been on a cruise before but would love to someday. I was on an Alaskan cruise and loved it. I think my son would love this cruise ship because his grandparents have been talking about taking us all on a cruise. My daughter would love this, we have dreamed of cruises as a family vacation. I’ve never been on a cruise before. PLAYMBOIL play sets are so much fun. I’d love to win for my niece. I like the fact it reminds me of my barbie camper I had as a child but as a ship. My daughter would love this. I have been on a cruise NKOTB – it was so much fun. so many great features, I think my girl would be pretty happy about that water slide! I have never been on a cruise. Maybe one day! I love the attention to detail of the play set. My granddaughter would love this toy. My granddaughter would love this set and sadly no i have never been on a cruise. I have never been on a cruise and my granddaughters would love this play set with the pool and all. Thank you! i know my granddaughter would love to play with this cruise ship. The parts are so realistic. I’ve been on one cruise, from Miami to Bahamas. My niece would love it! And, yes, I have been on a cruise — one to Mexico and one to Alaska. My granddaughter is obsessed with boats and would love this. My grandson has been on a cruise and would love this. My granddaughter would love this toy,she could be so creative in ideas with this toy ! When we will finally go on vacation I’d like it to be the cruise, I’ve never been on one before. I have been fortunate enough to go on a cruise. This playset is so cute ! I have never been on a cruise , I have always wanted to though ! I think it would be so much fun ! Hopefully someday ! I have never been on a cruise, but I would love to one day. I recently got to see 2 cruise ships in the harbour in Skagway, Alaska. They are HUGE!! My niece would love this set! I haven’t been on a cruise but would love to. I am thinking of going to the Caribbean. I’ve never been on a cruise, but would love to. My youngest grandson would love this playset! My niece would love this playset. I haven’t been on a cruise but I would love to go on one! I have never been on a cruise…too many other places to explore first I suppose! This cruise set would be fun for the kids though. I think my granddaughter would love this set ! My niece would love this set, though I”ve never been on a cruise she has! I would be happy to take another cruise someday. My niece would adore this set! My granddaughter would be taking a cruise on the high seas with this set! I have never been on a cruise….WAH!! I think both my niece and my nephew would love this playset! I would love to go on a cruise but I never have! I like that this toy is built to last and can take rough play from little hands. I would love to win this for my nephew. No,i have never been on a cruise,but you never know maybe someday! I haven’t been on a cruise but would love to go. I love this Cruise ship playset and it would make a lovely gift for my nephew. My little guys would have lots of fun with this! My granddaughter would have hours of fun with this cruise ship ! Definitely my kids would love this set! Nope,have not been on a cruise but i sure would love to! My daughter would love this! She’s obsessed with boats right now so she would be so excited to play with this. I like how the top of the ship is removable to access the lower deck! The fillable swimming pool is a big bonus, that really fuels the imagination! I have cruised once before and would love to someday do it again. I have never been on a cruise before, nor would I ever (deep seeded fear of water lol). My youngest two boys would love this, thanks so much for the chance. I did watch Ghostbusters and loved it! My granddaughter would have hours of fun with the cruise boat ! I love that everything is so realistic and can be easily moved. I have never been on a cruise! I have never but i sure would love to take a cruise someday ! I really like the gangplank. It would be fun to play with. I’ve never been on a cruise, but would love to! My girls would have a ton of fun with this cute cruise ship. We are taking our grandchildren on a cruise next year as part of our trip to Disney. This playset would be great for them! We have been on a couple of cruises and they are not my favourite, however, I do not mind shorter cruises as part of a land vacation. Thanks for the super giveaway opportunity. I have never been on a cruise but would sure to take one. An awesome ships with many parts my granddaughter would love this ! I think my kids would certainly love this set. I like the realistic components of the set. I would love to gift this to my friend for her kiddies!!! Not yet but someday i hope to take a cruise! I love the little “people’. They are realistic. My granddaughter would have hours of fun with this set ! this is so flippn cute. I love this set it would encourage imagination play ! My kids would love this set! I really enjoyed the only cruise that I have been on.